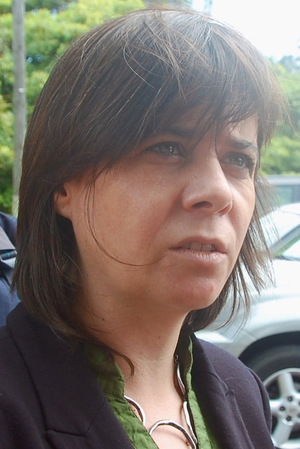 Martins emerged as a leading spokesperson of the Portuguese Radical Left Bloc in its breakthrough election performance in October. The anti-austerity Bloc got a record 10.2 per cent of the vote (up from 5.2 per cent) with 19 seats (up from 11), becoming the third-largest parliamentary party behind the two old warhorses of the Right (Portugal Ahead) and the Left (Socialist Party). Martins is a 42-year-old blunt-spoken actress and co-founder of the Porto-based Useful Visions Theatre Company. Her characteristic jeans and red blouses offset the suits and ties that usually adorn Portuguese politicians. She is among several women leading the Bloc to challenge a political class she calls ‘mostly men of the same way of thinking’. She exhibits canny political sense which helped the Bloc make common cause with former Lisbon mayor and current Socialist leader Antonio Costa to bring down the austerity-addicted Conservative government of Pedro Passos Coelho. The Left Bloc is now well-placed to influence the new socialist government to challenge the austerity demands and hardball tactics of the infamous Troika of European Reaction – the EU, the IMF and the European Central Bank. As events in Greece and Spain are proving, these are very choppy waters indeed. ‘Caterina the Great’, as her more exuberant fans call her, has already proved a formidable opponent with popular resonance in media debates around the election. She has shown the all-too-rare ability on the Left to ‘speak to people about issues they understand in a language they understand’. She will need it.